There’s no question that a distracted driver causes accidents, and in today’s modern, tech-fueled world, this is a concern now more than ever. The National Highway Traffic Safety Administration (NHTSA) reports that distracted driving accounts for 3,450 fatalities in 2016 alone. 2015 saw 391,000 people injured in motor vehicle crashes involving distracted drivers. America’s roadways are truly seeing an epidemic. NHTSA defines distracted driving as anything that takes the focus of the driver off of the road—a phone call, texting, eating or drinking, interacting with the vehicle’s passengers, and fiddling with any gadget or system that modern cars are equipped with. The most concerning aspect of America’s distracted driving problem is the need to be on and use our phones constantly. Specifically, teenagers, who are reportedly the largest age group contributing to the cause of accidents with distracted drivers. But what if there was something that could help? They say ignorance is bliss, and this proverb could be transformed into a theory, especially when it comes to teenagers. Today’s teens seem to be inherently equipped with the impulse to respond and check their smartphones the second they buzz, ring, beep, or burst into a song. Perhaps if the phone sends all incoming messages to a purgatory state until the teen in question safely reaches the destination, we could reduce the agonizing number of distracted driving fatalities and injuries. If you’re thinking it, then Apple has already implemented such a feature. 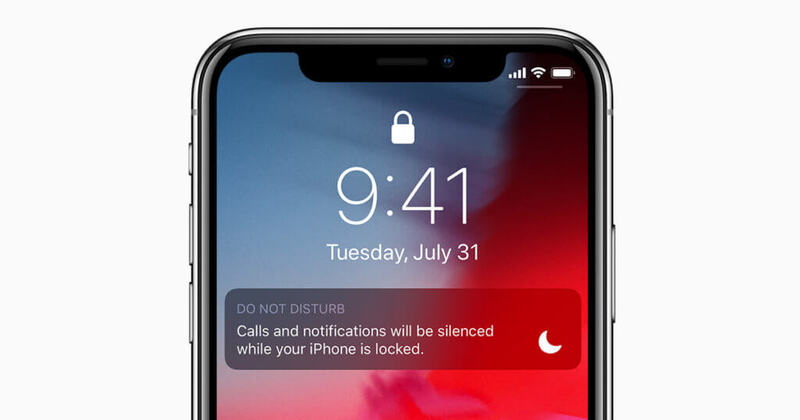 Do Not Disturb While Driving was created for iOS11 and beyond, and is Apple’s saving grace response to the distracted driving crisis America faces. Now, the temptation to even pass a mere glance at the iPhone’s locked screen is melted away with this new feature. An article published in April of 2018 by USA Today focused on statistics resulting from an auto insurance company called EverQuote, whose app, EverDrive, available on iOS and Android passively monitors its users’ driving habits. EverDrive analyzed the 781 million driving miles collected from user data to report a terrifying trip time average of 6% was spent on the phone. To put this into perspective, NHTSA says that just reading a text for as little as five seconds while driving at 55 MPH is like driving the length of a football field blindfolded. It’s no wonder why the Centers for Disease Control and Prevention reports 9 deaths and 1,000 accidents a day caused by distracted driving. But Do Not Disturb While Driving is cutting down these nightmarish statistics. Since the feature’s debut, 80% of EverDrive users with iPhones have decided to activate Apple’s Do Not Disturb While Driving on their phones. And another statistic to help you sleep at night: EverDrive reported that their users with this feature turned on managed to decrease phone use during driving by a whopping 8%. So, how does Do Not Disturb While Driving work if you opt to turn it on? There are a couple different ways your iPhone can detect that you are driving. Motion detection and the ability to check network connections can allow the iPhone to automatically see if you are driving. Do Not Disturb While Driving can also be activated when your car’s Bluetooth capabilities link to your iPhone. Or lastly, you can manually switch Do Not Disturb While Driving before you hit the road. Apple temporarily blocks messages and notifications while you are driving, but in case there’s an emergency, your friends and family can reply with the word “urgent” in their message to break through Do Not Disturb While Driving’s wall. The feature can also be customized to allow calls from your Favorites, or if someone tries to call you twice in a row. For those that attempt to contact you while driving, they will receive an auto-reply message notifying them that you are driving. You can also pick and choose who receives an auto-reply message, and the settings for the feature give you the ability to customize this auto-reply message. Teenagers trying to outsmart this feature will find that Apple is five steps ahead of their plans to turn off Do Not Disturb While Driving. Parents of young drivers can access the feature on their child’s phone by going to the settings menu, turning on the Screen Time option, then continuing on to tapping the “This is My Child’s iPhone” option. Next, the parent can continue on until the Consent and Privacy menu, ultimately creating a Parent Passcode. Finally, by turning on the Do Not Disturb While Driving feature, the child will not be able to disable it without the parent passcode. You can find the full instructions on Apple’s official website. By not giving teens the option to check their pressing social media notifications and texts from friends while they are driving from point A, the Do Not Disturb Feature quite literally keeps them in the dark until they have safely reached point B. Apple is setting the standard by going backwards in limiting our connections to each other—at least while we are on the roadways. Smartphones may not be the only reason for distracted drivers, but they do make up an immense portion of distracted driving accidents. By at least eliminating one distraction, we can expect to drastically cut down our heartbreaking statistics of roadway accidents in the future. If you’ve been in an accident contact Aronberg, Aronberg and Green today to fight for your rights and get what you deserve.